You bought it, but are you really going to read it? I’m going to start this post with the disclaimer that my words may hit a nerve with one or two of you. It’s never my intention to offend, rather open a door for discussion. We’re going to talk about book hoarding and what it means for books when people collect them, yet never get around to reading them. Nothing sends a shiver down my spine more than when somebody tells me they have more books than they have room for, or that they have over 5000 books with the majority unread. I know one lady who spends her daily lunch hours in an old used bookstore, bringing home at least 20 books a week .I swear to god she spends more time shopping for books and she does reading them. I know another who has at last count, three plastic tubs of paperbacks hidden under her bed so that her husband won’t find them. These too go unread. But why? Why do people collect books only to hide them away or stack them up in boxes and bags? This obsession with owning books must feed more than a desire to read. It’s an expression of something deeper, an unspoken need that manifests in book hoarding. My grandmother collected salt-and-pepper shakers. She had a 6 x 5 wood and glass shelf that hung on a wall in her living room. I spent countless hours of my childhood staring at the shakers and making up stories about them. When my grandmother passed away one of my cousins and I split the shakers. I got the ones that meant the most to me; the ones that my mother had given to my grandmother, the ones that my aunt, who was a second mother to me, had given to her and the ones that my grandmother talked about the most. These salt- and- pepper shakers now sit in a cabinet in my kitchen along with several others that friends and family have given me over the years. When I ran out of shelf space I said “enough” I’m not collecting them anymore, just as my grandmother stopped when she ran out of room. At some point the objects themselves can become meaningless and the act of collecting for collecting’s sake takes over. Books are meant to be read. Authors do not spend countless hours pouring their souls into their work only to have us collect them to be put in bags and bins and hid away for secret storage. When we do this the stories and words contained in these books lose all their value. They become objects with no real meaning. When we buy books and hide them we are taking away someone else’s chance to buy them and actually read them. 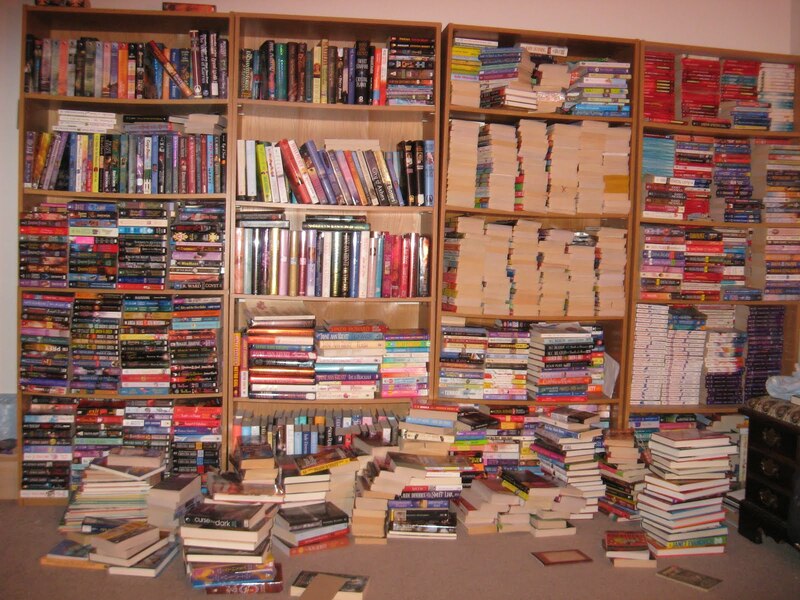 This is what puts a shiver down my spine when someone brags about his or her book hoarding/collecting. They are disrespecting the stories and authors who write them. They are taking them away from other readers who will appreciate them in the way books are meant to be appreciated. If you buy it, are you going to read it? If not, you may want to ask yourself “why”. Today I’ll just add the title and a description to my list, confident that I’ll be able to get it easily whenever I’m ready to read it, even if it’s obscure. So yeah, I have a huge book collection, most of it unread, but I keep all but a tiny fraction of it in libraries and bookstores around the world. Hoarding anything is never a good thing, as it tends to overwhelm the hoarder’s thoughts and actions. I don’t think book hoarding will become less common, in fact, I am afraid it may increase as we lose more and more access to books. I hear Barns & Nobles will be closing some stores. As an avid reader I am always on the look out for a good book, and yes, often if I see a book that I fear I will not find again, I will buy it. Like you though, most of the time a new tile will go on my digital wishlist. I also have a personal rule: Every June, I cull through my “books to be read” shelves. Any titles that have been on the shelf for two years, goes into my “books to give away” pile. I know others whose book “expiration dates” are longer, some are even shorter. By the way, I love your idea of a book collection! Thanks for stopping by. You know I’m a book hoarder, so I guess I don’t need to explain that part. However, I am at a point in my life (again) where I am at a distance from my collection. As always it upsets me maybe more than it should. I often miss my books, but it’s sometimes because I could actually use them. I have never been a huge hoarder of fiction after I read them, unless it’s something that really touched me or that I plan on reading again. However, in the past I was buying fiction books like the woman you mentioned in the post. I do that less now. I refuse to feel bad about the hoarding of non-fiction. I’m never done with a non-fiction book. Your post, however, has got me thinking about the masses of fiction books I own. I’m thinking when my books return to my side, there will be some weeding done. Thanks for making me think about that more. I think you’re completely right about it being just like hoarding any other object, it fulfills a deeper need. That doesn’t make it right, and with books, (again, you made this point well in your post) it really is depriving someone else. Great post, and great post idea! Some people buy endless pairs of shoes. Others buy books. I guess it would take a psychologist to tell us why that happens. In fact, I’m quite eager to read on the topic. I think what may happen with people who buy more books than they get to read is that they fail to appreciate the time it takes them to read those books. I think if you ask them they would tell you that they would get around to it sometime. I don’t have an “expiration date” for my books. Sometimes I would read a book 2 years after I bought it. But it could also be 3 or 4 years. Over the past 5 years, I read a third of the books I bought. But that’s only because I once bought tens of titles in a collection that came very cheap — they were all books I had (and have) every intention to read, so see? another reason. Without that particular collection, I think I can say that over the past 5 years, I read 75% of the books I have bought. All that said, I go through my collection (all of it, not just the one I mentioned) often and purge it of titles I won’t need anymore. Hmmm, am I a book hoarder? My wife might say so, but the fact is that I do give away some books to charity shops and some to friends and relatives. However, my capacity to read is outstripping my ability to acquire more, and my ability to review them once I’ve read them is faltering. Let’s put reference books to one side, and a proportion of other non-fiction (and probably classic fiction). By definition, they’re titles I will refer to again, or a least may refer to again. Of the rest, a nominal star system for fiction works for me: if four or five stars I’ll probably read them again or until they fall apart; three stars or less they’re going to be recycled. Or, if really dire, binned. When I’m approaching my dotage I’ll probably get shot of all of them. After that, I won’t remember if I had them or not, let alone recall reading them. I might not even remember what a book is. Sounds like you read the books you have, at least you didn’t admit to storing books for “someday”. It sounds like you and I have the same attitude towards books. I tend to keep all of the nonfiction books i buy for the same reason as you. A few months ago I wrote a paper on myths found in Shakespeare’s Midsummer’s Nigh Dream. Luckily for me, it was easy to do research right from my own library. That’s what sons are for, I suppose! Your MND paper sounds interesting. Has it been published yet? The paper was for graduate school. I wish I could boast of being a published Shakespeare scholar. I am working on it! The paper compared Bottom’s transformation to Chiron, wisest of the Centaurs. In my research I found a couple of lines supposedly said by Chiron that matches Bottom’s speech upon waking. I thought I found something new, but no, it turns out earlier scholars had noted this too. At least I am in good company. Previous Previous post: Shakespeare and the Kardashians.